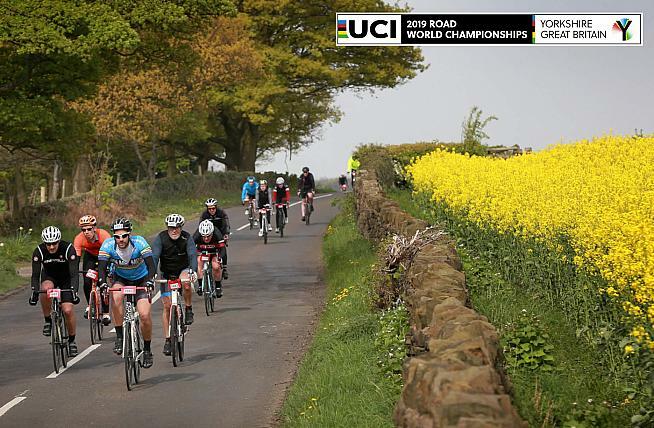 The official sportive for the 2019 UCI Road World Championships takes place in Harrogate, Yorkshire on 22nd September - here's how you can take part. Experience the route of the 2019 UCI Road World Championships on the official sportive. 2019 sees Yorkshire play host to the world's top professional cyclists, as the UCI Road World Championships come to the UK for the first time in 37 years. And 5,000 fans will have a chance to get involved as entries for the official sportive open on 4th March. Set in the stunning scenery of the Yorkshire Dales, the official sportive will start and finish in Harrogate and take riders on a journey through the natural beauty of some of the best UK cycling, including large sections of the UCI World Championships courses. There will be three routes, Long 145km; Medium 98km; and Short 72km, suiting all abilities and experience. All routes will ride the Harrogate circuit before any of the pros. The maiden Mixed Relay Team Time Trial will follow on from the sportive, also departing from Harrogate ensuring the sportive will get the classic Yorkshire welcome and support. On finishing every participant will get a specially designed medal and then they can sit back and enjoy the atmosphere of the 2019 UCI World Championships for a perfect day of cycling. Huge demand is anticipated for this one-off event, so the organisers have set up a ballot ticketing system to allocate entries. Cyclists wishing to take part can register their interest via the website from 4th - 20th March, with results announced on 27th March. Nick Rusling, CEO of Human Race says, "The UK's reputation for cycling has grown and grown and nothing says it better than the UCI World Championships. We are really excited to be able to offer this once in a lifetime event to the cycling world. We always strive to offer memorable and unique experiences here at Human Race and it doesn't get much more unique than this." Sir Gary Verity, Chief Executive of Welcome to Yorkshire said: "The UCI Road World Championships in Yorkshire this year will be one of those 'where were you when' moments, so to be one of the 5,000 amateur cyclists taking part in the official sportive, riding on the same roads as the professionals, in front of massive crowds will be will be an unforgettable experience!" For more information and to sign up for 2019, visit worlds.yorkshire.com/sportive.